S 1/c Judson C. Barnard, son of Mr. and Mrs. J. C. Barnard, attended Frederick High School. 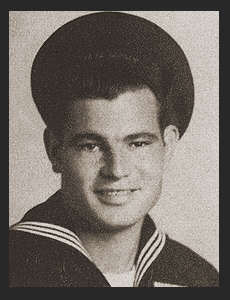 Entered the Navy in July 1943; trained in San Diego, Cal. ; served in Pearl Harbor, the Marshalls, the Marianas, Iwo Jima; awarded Am. Theatre Ribbon, Asiatic Pacific Ribbon with three Battle Stars.